After Pierce Brosnan’s first Bond movie (Goldeneye) was such a major hit, the budget and the expectations skyrocketed for his sophomore outing. What follows is an entertaining, by-the-numbers action movie that is the definition of a Brosnan-Bond flick. By 1997, it already felt like he had been Bond for over a decade. Being the “runner-up” for the role in 1986 probably helped with that feeling. When the film was released in December of ’97, it went head-to-head with Titanic. While Tomorrow Never Dies did very well at the box-office, I don’t think I need to tell you which movie won the battle. Not to be completely outdone by that huge doomed ship, this Bond movie does offer its own sinking vessel. Bond’s coolest moment? I think it has to be “Hamburg Bond”; as he oozes cool, confident charm at the CMGN party. Out of the six Bond actors, Brosnan might be the best tuxedoed one. Bond’s most embarrassing moment? His love scene, in his hotel room, with Paris Carver comes across as something from a daytime soap opera. I’m surprised the camera lenses weren’t covered in petroleum jelly. Not sure I ever want to see Bond biting shoulders. Best acting performance? It’s Michelle Yeoh by default as Wai Lin. Teri Hatcher as Paris Carver is a kind of dull Tracy from OHMSS. And forget about Jonathan Pryce as Elliot *cough* (Rupert Murdoch) *cough* Carver. This villain is eating up so much scenery, I’m shocked he doesn’t have pieces of the set at the corners of his mouth. Bond’s #MeToo #TimesUp moment? Not so much a “moment”, but I would have loved some backstory on how Bond ended up in bed with the young Danish professor. Worst line in the movie? Carver on Bond possibly floating out to sea: “He’s my new anchor man.” He then proceeds to mock Wai Lin’s martial arts skills. Pathetic indeed. What I noticed for the first time after watching this for the 89th time? When Q and Bond are playing with his new car’s remote control/cell phone in the airplane hangar, there’s a worker checking it all out from an airplane. He’s going to have quite a story to tell his coworkers. Best action sequence? This movie certainly doesn’t lack action scenes. Plenty of solid ones to choose from. I’m going to go with the motorcycle chase, with Bond and Wai Lin handcuffed together. Runner-up is the pre-title sequence at the Arms Bazaar. Fun for the whole family. Who or what is the title song about? Considering the opening line of the song is “Darling I’m killed. I’m in a puddle on the floor” I gather it’s one of the rare Bond songs written for all the dead girls from his past. Best looking cinematic moment? Every exterior shot in Hamburg. I want to stay at the Atlantic Hotel. How could the villain have succeeded? Maybe I’m just not rich enough to understand, but Carver had to have spent a fortune on his sinking of the Devonshire, shooting down the Chinese MiGs, etc. Would starting a war between Great Britain and China really have made him any richer? Seems like a waste of time and money, all for 100 years broadcast rights in China. What I’m saying is… he should have waited a decade or two and created “fake news” instead. Which other Bond actor could have starred in this movie? As stated before, this is a very “Pierce Brosnan as 007” vehicle. Although twenty years earlier, I could have easily seen Roger Moore in a Bond movie like this. Does Bond ever think he might die? When Dr. Kaufman has the gun pointed at him he does seem nervous. Thank heavens for his Sony Ericsson cell phone. By the way, I want to know which celebrities Dr. Kaufman murdered and made it look like a suicide. What would have made the movie better? Swap Sheryl Crow’s mediocre title song with K.D. Lang’s slam-bang end credits song, which sounds like an ode to Shirley Bassey. What’s in a name? James Bond the secret agent, pretends to be James Bond the banker. This works for about maybe two minutes. What’s in a title? 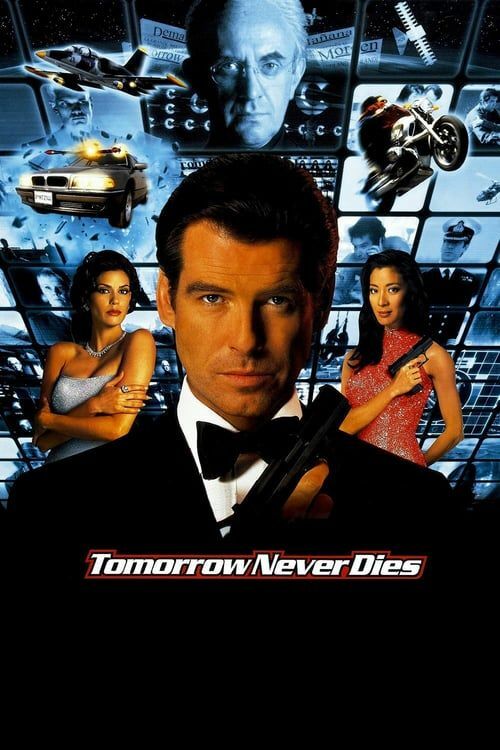 Originally (more appropriately) titled “Tomorrow Never Lies”, Tomorrow Never Dies is the first Bond movie title to not have any connection to Ian Fleming at all. As for the two previous films, “Licence To Kill” is phrase from past novels, and “Goldeneye” was the name of Fleming’s Jamaica home. Drinking game: Take a shot of Smirnoff vodka any time someone mentions “GPS”. “WTF? !” moment: Wai Lin walking the wall after using her wire wrist piton gadget. Bond stops for a good three seconds to watch her, while Carver’s security guards shoot at him. Keep moving James! Fun fact: A young Gerald Butler plays one of the Devonshire crew. Overall ranking: 17 out of 24.
Review synopsis: It has every element you want in a Bond movie. Terrific action set pieces, two Bond girls, interesting locations, a bleached blonde henchman, and a villain with an over-the-top plan. Yet, Tomorrow Never Dies doesn’t fully live up to the expectations. It’s no Goldeneye. Sometimes it wants to be a serious movie, then it wants to camp it up. In the end, it’s an entertaining chapter in the franchise, that moves at such a brisk pace that the average fan may not remember it ten minutes later.